I had a friend say to me recently She did not want to be a Grandma because she did not want to worry about another child . Her children are in their late teens and early twenties so she has time to change her mind. A parent can spend their child’s whole life worrying . Everyone knows there is plenty to worry about with children these days. 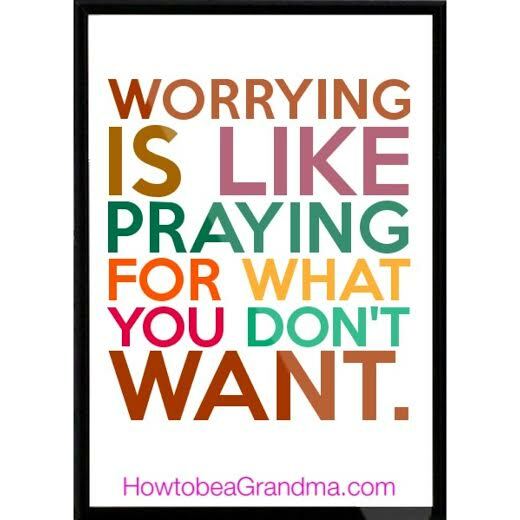 I came across this saying ” Worrying is like Praying for what you don” t want to happen” and it makes a lot of sense. As a grandparent worry will be a part of your relationship with your grand children. But as we all know worry does not accomplish anything productive. How is your worry for your grand child different then for your child? How do you manage your worry for your grand children? « Everyday is So Much Better !